Before all of this Christmas festivity winds down, I just wanted to take a moment to share these winter-y photos captured by my talented friends Paul and Rod during last week’s snowfall (which is now long gone). I hope you had a wonderful Christmas! Those shoes always gives a special touch to any outfit! So cute and cozy! Love your super long cardigan, is a fantastic piece! Pow!! Talk about colour impact…that clutch is amazing!! And a perfect compliment to your red lip!! A very pretty, unexpected look!! You look AMAZING! 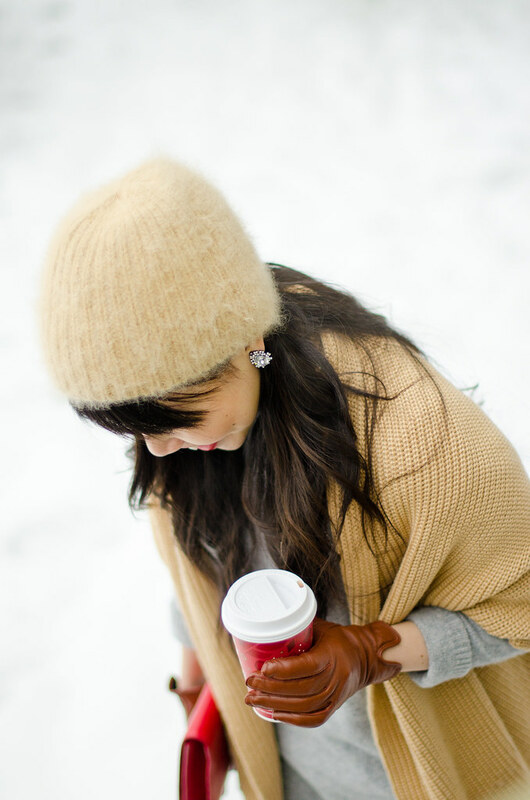 I love this cozy look mixed with your glamorous clutch– the pop of red is perfect. Found your blog by googling “Canadian fashion blog” and am really glad to have stumbled across it! I love that clutch. Beautiful colour. Beautiful look, love these pastel colors and warm textures with pops of red!!! Hope you’re having a wonderful holiday season and almost Happy New Year!